Hudson Poly Bag extrudes and prints poly tubing using an in-line printing process on all seven-extrusion lines for simple one-color prints. For the more intricate and multi-color printing, one of three printing presses is utilized. We deliver printed poly tubing on time, on spec and on price. We simply do what we say that we will do. In-line presses are capable of printing 1 color on 1 side with an approximate 12″ repeat. 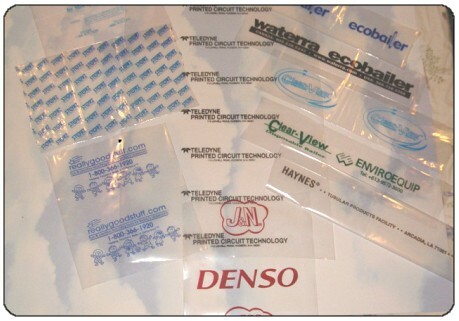 The primary end uses for this type of printing are custom branding of product or printing suffocation warnings or recycle codes. We have successfully printed 1 1/4″, 5 mil tubing up to 30″ tubing. For applications that are more demanding than a simple one-color print, Hudson Poly Bag offers up to 4-color printing on one of their three printing presses. A wide selection of printing repeats, tubing widths, gauges and colors is available. We can also print on very narrow width poly tubing that is extruded in house.